The Goodwill Festival is a Full Moon Festival occurring during the sign of Gemini (May 20 - June 20). It celebrates the spirit of humanity and is aligned with the will of God. At this Festival the divine nature of humanity is recognized and called upon. This is a Festival of unity and deep invocation, of humanity aspiring toward its essential divinity and the establishment of right human relations. In 2018 the Goodwill Festival Full Moon occurs Tuesday, May 29 at 7:19am PDT (14:19 UT). Many cultures have seen two humans in this star pattern — marked by two roughly parallel lines of stars capped by two of the brightest stars in our night sky. 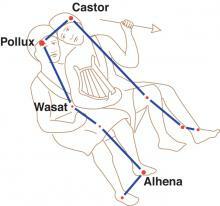 But the legend that endures is that of Castor and Pollux. Gemini's two brightest stars bear the names of the twins. The emanations of Gemini keep the interplay of energies between dualities active and flowing so that eventually they reach synthesis and unity. Gemini is "the constellation of the resolution of duality into a fluid synthesis." Gemini is the constellation that forms a triangle with each pair of opposing constellations ... the 12 constellations can then synthesize and become the 6. The ongoing evolution of humanity's consciousness is dependent on the emanations of our zodiac, the wheel of Life, and fundamentally upon the synthesizing quality of the Gemini constellation. The Gemini Goodwill Festival is uniquely linked to humanity and spiritual aspiration. Why? It is said that the constellation Gemini along with its ruling planets and the Great Lodge were responsible for setting up the necessary stimulation and magnetic fields between the animal and spiritual kingdoms, which in turn produced individualization and the human kingdom. In other words, the human kingdom was born of the animal and spiritual kingdoms with the help of the fluid synthesizer, Gemini. Therefore, humans are inherently spiritual and born to aspire toward their divine nature. Humans were created from two kingdoms, animal and spiritual, and are thus a duality of spirit and form, of soul and personality. The constellation Gemini assists the human kingdom in the unification of these polarities, and in turn, humanity becomes whole and divine. Humanity's spiritual aspiration is enlivened during the sign of Gemini and potently activated during Gemini's Full Moon Festival of Unification. In addition, Gemini is the entrance for the energy of Sirius, which esoterically is the cosmic heart of our solar system's physical Sun. Upon the golden triangle, the Cosmic Christ appeared; His head in Gemini; one foot upon the field of the Seven Fathers and the other planted in the field of the Seven Mothers. Thus for aeons, the Great One stood, His consciousness in-turned, aware of three but not of four. Note: The constellation and star cluster, Seven Fathers and Seven Mothers, are sometimes called the Seven Brothers and the Seven Sisters or the Great Bear and the Pleiades respectively. The Cosmic Christ's eternal, golden triangle is forever present behind the fourfold phenomenal appearance of matter. It is the threefold flame burning in one's Sacred Heart – Divine Father, Divine Mother and the Christed Child. In astrology Mercury, Venus and Earth are the rulers of Gemini. Mercury, the exoteric (personality) ruler of Gemini, conditions the personality life and creates Divine messengers. Its emanations first stimulate the concrete mind to distinguish between the self and not self. They then illuminate the higher mind creating a link between the personality and the Soul. Note: In 2018 during the Goodwill lunar cycle, May 15 - June 13, Mercury, too close to the Sun's glaring light, is hidden from our view. It's as if Mercury messenger of the gods is communing with the god of our solar system. What divine message will Mercury bring you, as he rises out of the Sol's sunset embrace in mid-June? Venus, the esoteric (soul) ruler of Gemini, helps one to understand the causes and conditions of harmony and conflict and thereby lovingly and wisely unite the lower mind with the higher mind. Venus is associated with the Pentecost. The Pentecost, celebrated 7 Sundays or 50 days after Easter, is intimately related to humanity's spiritual aspiration and Gemini's Goodwill Full Moon Festival. 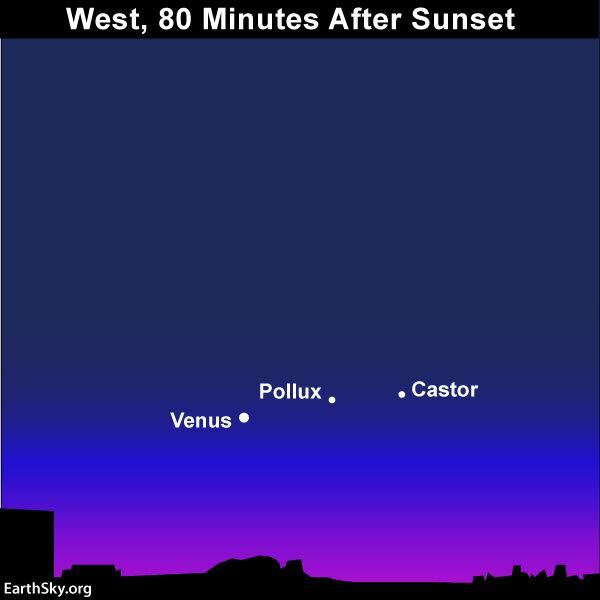 Note: Venus completes an 8-year cycle of movement that forms a 5-pointed star in the heavens. Earth is the hierarchical (spirit) ruler of Gemini. Galactic and solar system energies meet at the Gate of Man found at the foot of the Gemini Twin, Castor. It is here that the Galactic Equator (Milky Way Galaxy) intersects the ecliptic (path of our Sun and planets). Helpful Image Gemini is therefore both a galactic and solar plane constellation. 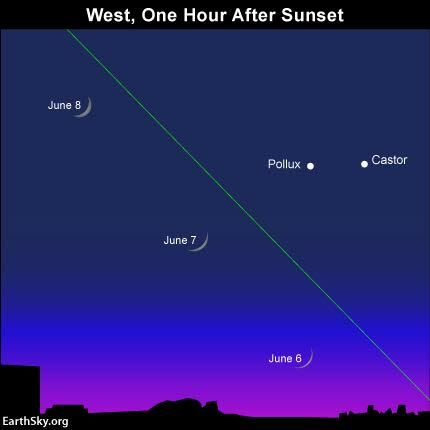 The Gemini Twins, Castor (form / personality) and Pollux (spirit / soul), work hand-in-hand integrating cosmic galactic energies, spiritual / soulic energies, into our everyday Earth plane existence. Note: It is said that the Gate of Man is the heavenly Gate through which Divine souls descend into human bodies. It is located in sidereal Gemini (the constellation at 5º) and tropical Cancer (the astrological sign at 0º). Opposite the Gate of Man lies the Gate of God, at 5º sidereal Sagittarius and 0º tropical Capricorn. Here Divine souls leave the body at death and return to the heavenly realms. Solar system energies and galactic energies intersect at both Gates. BTW: Galactic energies also play a prominent role during Gemini's Goodwill Full Moon Festival. This Festival's Full Moon always transits the bulging Heart of our Milky Way Galaxy, which is located in the constellations of Sagittarius and Scorpius. Galactic Center Map To learn more see the link below – Goodwill Festival and the Galactic Heart. The birth of the Human Kingdom and its ongoing evolution are uniquely linked to the fluid synthesis of Gemini. Cosmic emanations of spiritual aspiration, cooperation, right relations, unity and a divine sense of the whole are focused through the constellation Gemini, and potently impress humanity during the sign of Gemini (May 20 - June 20) and its Goodwill Full Moon Festival. Tune to the cooperative Gemini Twins. Though opposites, representing the form (Castor) and spirit (Pollux), they innately work together for the benefit of the whole. They integrate galactic and Earth plane energies. United, they accomplish greater feats than either can alone. Imagine humankind within every nation uniting to express the divine potential that benefits all!